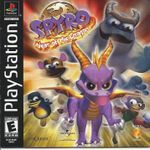 Named after the animal of the Chinese zodiac, Year of the Dragon follows the titular purple character Spyro as he travels to the "Forgotten Worlds" after 150 magical dragon eggs are stolen from the land of the dragons by an evil sorceress. Players travel across thirty different worlds gathering gems and eggs. Year of the Dragon introduced new characters and minigames to the series, as well as offering improved graphics and music. Source: Wikipedia, Spyro: Year of the Dragon, available under the CC-BY-SA License.